I am a little too old for this show, meaning I didn’t grow up with it. It incites great love and devotion to 90s children, and I can’t quite relate, except to suppose maybe it’s their Growing Pains. If the pilot is any indication it’s pretty cheesy, but in a lovable way that makes you want to see these characters through their first world problems. The show, which ran for seven seasons, begins when its main character, Cory (Ben Savage — yes, Fred’s little bro) is eleven. Knowing that Cory and heart-throb Topanga ended up married (oh, um, spoiler alert), I thought the show must have hit fast-forward on their ages at some point, but no. They got married at 18. So these pre-teen and teen years we’re about to witness are precious. The pilot is noteworthy for the fact that it doesn’t seize on any of the standard pilot tropes for its premise; it’s not the first day of school, there’s no new student in class, it’s not an anniversary or the day someone dies. The opening scene in the cafeteria lets us know this is just a typical day in which Cory eats junk food and talks back to authority figures. Side note: Why do television sets of school interiors always look like they’re made of cardboard? The theme of the episode is fresh-faced, smart-mouthed Cory’s lack of understanding about love. His English class, under direction by his nemesis Mr. Feeny (William Daniels), is studying Romeo & Juliet. Reluctantly playing Romeo, Cory refuses to stab himself on the basis that love isn’t worth all that. As if the whole world is conspiring against Cory in this love thing, older brother Eric (Will Friedle) ditches him to take a girl to a baseball game. No matter, because Cory ends up stuck in detention on the night of the game. We meet Cory’s good-natured and happily married parents, little sister, and two best friends — one of whom (Rider Strong) is as identified with the show today as the leads. Further complicating Cory’s prepubescent angst now and — I’m guessing — for the duration of the show, Feeny lives next door to Cory’s family. Cory can see into Feeny’s house from his tree house. This device provides a moment of character development in the pilot, and will likely come up again. 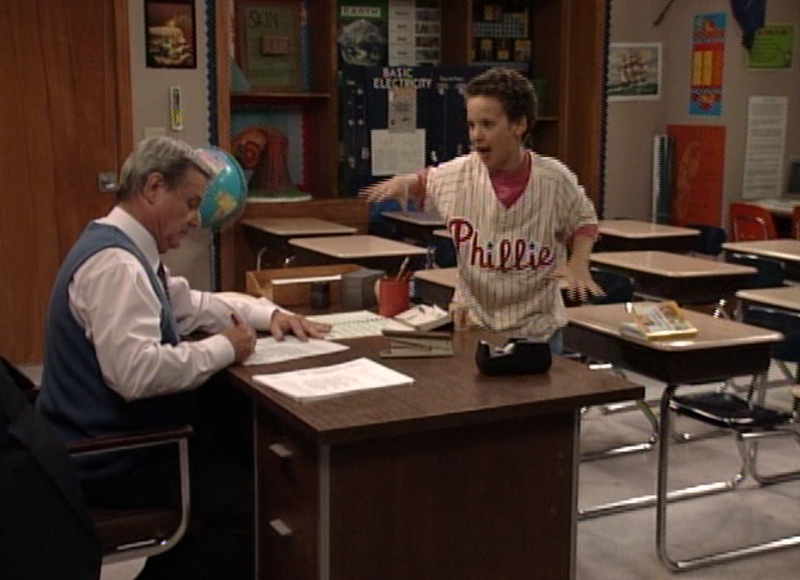 In a classic “Locked in a Room” trope, Cory and Feeny develop a new respect for each other during the aforementioned detention. In the process, they muse about love, Romeo & Juliet, and loneliness. It’s all wrapped up nice and neat by the end, with plenty of laughs boosted by an incessant laugh track. If you’re a fan, you’re well aware of the forthcoming sequel series, Girl Meets Word. If you’re not, here’s the low-down. This entry was posted in 1990s, Comedies and tagged 1990s, Ben Savage, Boy Meets World, Danielle Fishel, Girl Meets World, laugh track, Rider Strong, Topanga, William Daniels by meekthegeek. Bookmark the permalink.